1. That which moves by means of mechanism and power within itself; especially, of a vehicle; self-propelling as distinguished from horse-drawn. 2. A self-moving vehicle; a motor vehicle. 3. A road vehicle, usually with four wheels and powered by an internal-combustion engine, designed to carry a small number of passengers. 1. A passenger vehicle that is powered exclusively by an electrochemical power source, or partially so powered; such as, a hybrid electric car. 2. An automobile powered by a motor supplied with electric current from a storage battery or other device; such as, a fuel cell. Electric cars were popular between the late 1890's and 1910 and interest in them has revived with new methods of generating electrical power. 1. The average electron-drift velocity in a semiconductor divided by the externally applied electric field. 2. A drift mobility of electrons in a semiconductor which consists of the electron velocity divided by the applied electric field. 1. The tendency of cells or compounds in a solution to move in an electric field toward an positive or negative electrode. 2. A characteristic of living cells in suspension (a dispersion of fine solid or liquid particles in a fluid) and biological compounds (proteins) in a solution to travel in an electric field to the positive or negative electrode, because of the charge on these substances. The property of a barrier material that facilitates or impedes the movement of electrostatic charges internally or on the surface. A horse-drawn vehicle; such as, a wagon. The use of a horse-drawn vehicle. 1. Unusual flexibility of the joints or greater than the normal range of motion in a joint, allowing them to be bent or moved beyond their normal range of motion. Hypermobility is often misused to describe extra movements as seen in a contortionist. 2. Increased range of the movement of joints, joint laxity, occurring normally in young children or as a result of disease; such as, Marfan's syndrome (disorder of connective tissue of musculoskeletal system or abnormal length of the limbs; especially the fingers and the toes) or Ehlers-Danlos syndrome (disorder of the connective tissue; such as, joints that bend too easily into extensions). 3. Excessive joint play (movement) which permits increased mobility. The area where two bones meet is called a joint and all joints have a cavity containing a small amount of synovial fluid, which allows for movement. The attached tendons, muscles, ligaments, and joint capsules hold the joints in their correct positions. Looseness of these supporting structures allows a joint to have extra motion and often, even normal activities that put stress on loose joints will irritate them. Hypermobility syndrome may include congenital hip dislocations; scoliosis (curvature of the spine); elbow, kneecap and/or shoulder dislocations; or frequent ankle or wrist sprains. 1. Relating to something or a situation of being incapable of moving: The audience was absolutely quiet and immobile, or motionless, when the lights in the theater went out and the drama finally started. 2. Concerning something which is fixed in place and unable to be moved: The baby buggy was locked into position and therefore it was immobile and couldn’t roll away! © ALL rights are reserved. To keep someone or something from moving or functioning: Karen's doctor immobilized her injured wrist by putting it in a cast. Jim was suddenly immobilized when another driver almost ran into his car while he was driving in town. A chemical sensor that is highly selective due to a specific enzyme incorporated into its structure. The ratio of the average drift velocity of an ion in a solution to the magnitude of the electric field causing the drift. 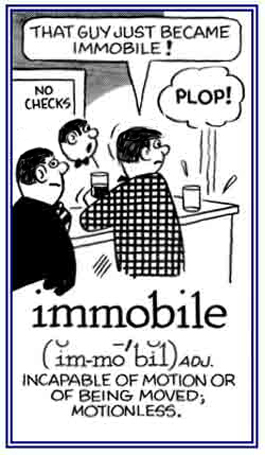 Related "move, motion" word units: cine-; kine-; mot-, mov-; oscillo-; seismo-; vibro-.